Learn to make striking, hand crafted beads using polymer clay to turn into one of a kind pieces of jewellery. Led by designer & maker, Therese Lyons of Ena & Albert, you will learn all the tips & tricks you need to get started with this fun & easy to use medium. One of the best things about working with polymer clay is the freedom to create your own colours, shapes & textures for one of a kind beads. This workshop will cover all of these steps as well as go over best practice tips including setting up your workspace, conditioning the clay, different ways for mark making, tips on how to choose colour palletes and how to design a finished necklace. A set of hand crafted beads made by YOU! Just your crafty sense of adventure! 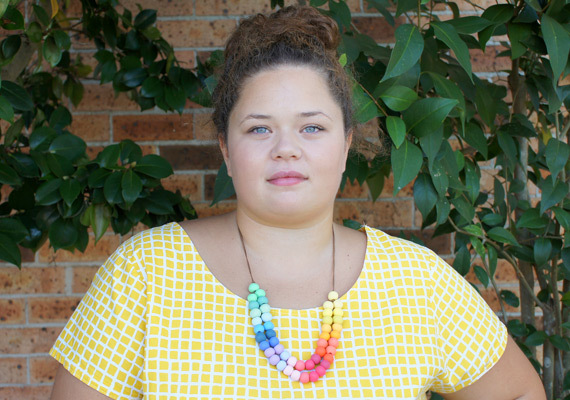 Therese Lyons is the designer & maker of Ena & Albert – a Sydney based jewellery label using hand crafted polymer clay beads. A true labour of love, Therese develops custom colour palettes for her designs & spends hours hand rolling and texturing every bead. She has been using polymer clay as her primary medium for almost 4 years and has a Bachelor of Creative Arts in Textiles. A lifelong maker with a love of colour & texture, Therese always jokes that she could sew before she could walk. Over the years, her love of textiles, dressmaking, weaving and illustration has grown immensely and informs a lot of her work. Therese is honest-to-goodness passionate about making and loves to encourage others to find a creative endeavor to suit them.